For the past week, I have been trying to accomplish one of my biggest goals…the hand-cut dovetail. As usual, I go through a lot of research before I actually get to work. Therefore, I have been reading up on some of the most well-known dovetailists and their techniques. I actually had two books on my workbench while I was going through the process of cutting the first pair (joint). I decided to go tails first based off of the books I have been reading. I can tell you after cutting a few of them this way, I was able to get good results. I’m not even going to attempt cutting tails first to see if there is any difference. I don’t really care…this is working for me, so I am going to stick with it. Cutting these by hand is a big leap for me, but one I was anxious to try. I am now really into the way the craft was practiced in the 18th and 19th century. I am finding it to be more enjoyable than machine work…not to mention less electric, noise, dust, and set up time. Specifically for dovetails it’s a big leap because I have a $400+ Leigh D4 dovetail jig (which works great) sitting on the sidelines. I can tell you, as good as this jig is, I can get just as good results within less time. I most likely will be posting the D4 up on Craigslist soon. Hopefully, I can get some decent cash for the jig when I sell it. You see, I don’t own a dovetail saw. I have been cutting these dovetails with my Lie Nielsen cross-cut carcase saw. It works so well, however, I am wondering whether I need to get a dovetail saw. Well, let me tell you the first joint did not fit right off the saw. In the end, I am glad it didn’t because I wouldn’t have learned anything. There is always something to learn from failure. The first joint I cut was too fat…way to fat in dovetail land. I had to do a lot of paring to get the final fit…it actually took me a couple of days because I was so fed up I had to leave it for the next day. At that point, I started questioning if I was going to go to hand-cutting dovetails. The second dovetail joint I was more aggressive on purpose so as not to leave it too fat. Well, I was still fat…not as bad this time. However, there was still far too much paring for me to live with dovetailing this way. That’s when I hit the books again. This is the point where I smacked my hand to my forehead. You see, I was using a pencil to mark out for the tails. Although the pencil was very sharp, the line is way to thick for marking out the tails. It also does not give me a reference for my saw, other than my eye…my eye aint that good. The magical tool that solved my issue was the marking knife. Thank you grandpa for this little gem you gave me. Dovetail joints numbers three and four fit right off the saw! What a difference the marking knife made. Not only does it make a finer line than the pencil I was using, but it gives my saw a reference. I am not sure why this didn’t hit me earlier because it is basically the same technique used for making saw cuts for tenons, cross-cuts, rips, etc. Well, these are saw cuts too…so why not use the same technique. After tracing the pins onto the tail board with the marking knife, I used my square to carry the line over the end grain of the tail board. As I began my cut, the saw would fall into this ‘trench’ and track on its line. The same thing happened as it tracked the angled line down the tail. I literally just let the saw follow the line I had made with the marking knife. I could not be happier with the result. I was able to cut and fit dovetail joints three and four in half the time it took me just to pare away joint number two. Had I been using the marking knife in the beginning I would have cut all four joints (for the box I am making) in a single evening…but then I would not have learned anything. I should note that I have the same issue with the D4 jig…to fat, which required paring. I was never able to really get any better than I can with hand-cutting dovetails. 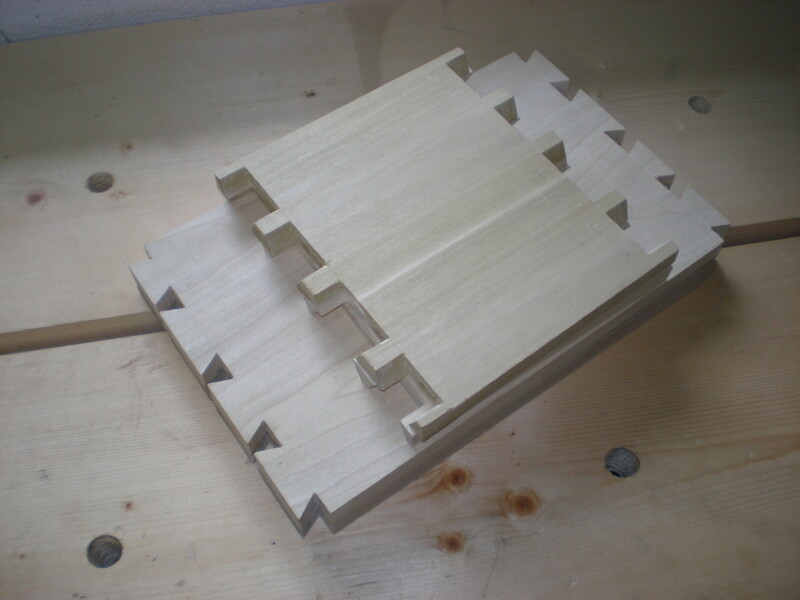 The picture in the header of my blog are dovetails cut on the Leigh D4 dovetail jig. I think I might replace that header with some nice ‘hand-crafted’ dovetails. This entry was posted in furniture, hand tools, VCF, woodworking and tagged D4, dovetails, furniture, hand tools, poplar, Schwarz, woodworking by villagecustomfurniture. Bookmark the permalink.